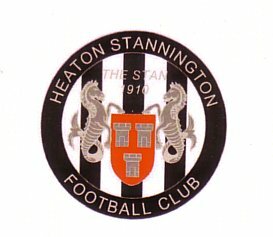 After suffering exit from the FA Cup on Saturday, the Stan were keen to put things right at Easington where they kicked off their league campaign. The Stan Army were as ever out in good numbers with around 25 and Heaton Stan Harry making the visit to the Welfare Ground. Despite being the middle of August the weather had a distinct autumnal feel about it by the time Easington kicked off with a strong Westerly wind in their faces. There were competitive debuts for Dan Robinson and ex-player Sam Walton and from the bench for Abu Salim and Joe Robertson. The first chance came in the very first minute when good work by Imray put Walton in but his shot was well saved by Easington glove man Donaldson. Both sides were looking lively and a good shot by Easington’s Noble just cleared the bar after 10 minutes. Dan Robinson was then put through with only the keeper to beat. He elected for the shot when maybe with hindsight he should have taken it round Donaldson but credit to the keeper who made a fine stop. Chances were few and far between with the wind causing problems for both teams. On 24 minutes more good build up play by the Stan resulted in a curling shot by Walton just going over the host’s crossbar. On 26 minutes there was excellent work from the Stan’s impressive Robinson who pulled it back for Walton who blazed it over the bar and nearly into the North Sea. On 37 minutes good work by Easington’s Goodey resulted in a shot sailing over the bar. As the rain came, a mix up by the Stan saw Imray clinically foul Kenney and take a yellow for the team. On 42 minutes a corner from the Stan nearly sailed into the net direct from the corner. As the second half got underway, the rain was a little bit stronger and Easington had the wind to their backs. On 49 minutes, Robinson earned himself a free kick just outside of the box. He took it himself but the wind didnt help and it sailed harmlessly over. On 50 minutes Easington had the ball in the net but the assistant referee rightly ruled it out for off side. Not to be out done though Easington took the lead a minute later when a shot come cross surprised Smith and the ball sneaked in from Easington left back Goodey who was understandably overjoyed. The Stan didn’t let their heads go down and created several chances but on 77 minutes there was a mix up in the Stan goalmouth and the ball fell to goal scorer Goodey who smashed it into the top right corner giving Smith absolutely no chance. Still the Stan tried but Easington, with their backs to the wind, easily soaked up the pressure. The ref blew for full time and the Stan suffered their second defeat this week. It was hard on the team, but they had 2 great chances to take the lead and in this league it can be very unforgiving. Still the lads played their part in an entertaining game on a dark and stormy night in Easington. Stan Team: Smith; McCabe; James; Leighton; Stoddart; Anthony (Yates); Imray (Y); Walton; Robinson (Robertson); Bailey; Dixon (Y) (Salim). Unused subs: Wear.